You must be logged in with an account that has both ROLE_ADMIN and ROLE_EDIT_SCHEMA roles. You must be logged in in single user mode. Step 1: Find the Security Settings in the Schema tab of the schema editor or by r-clicking on the Schema node ( ) in the Projects window and choosing 'Configure security...'. This will only be enabled if your have the role ROLE_ADMIN. Step 3: The current settings (if any) will appear in the editor. If you want to edit the current settings make your changes in the editor and click OK to apply changes. If you want to use a different template select it from the Templates drop-down box and click the Select button. That template will be set into the editor where you can edit it (if needed). Apply changes by clicking OK.
You can also specify a description for the current settings, though when you select a template an appropriate description is automatically defined. 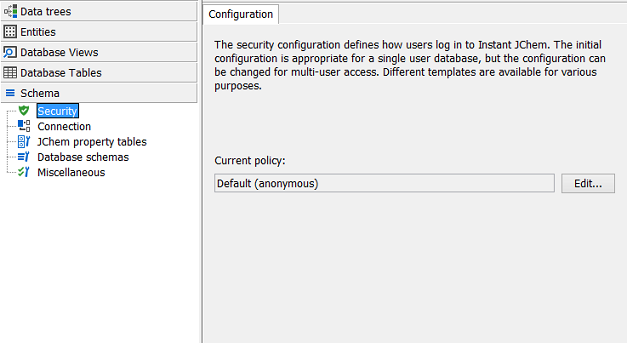 If you need to set the security settings back to their initial default value (anonymous authentication with all roles) there is a template for doing that. Step 4: Once the settings have been applied you should disconnect from the database and login again. The new settings will be in place. If you did not make any changes to the templates you should be able to log in with username and password as admin. 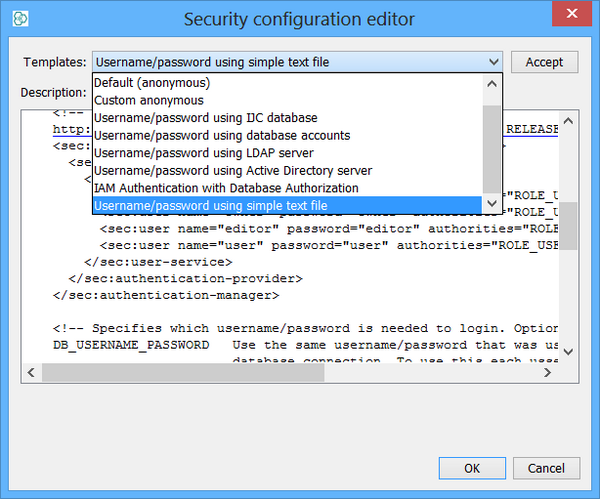 Consult the description of each security type for more information on how to manage users and their passwords.